Storms of the solar kind with the A hitting 78, and storms of the meteorogical kind over the BERU weekend caused all sorts of problems for entrants this year. Who said it couldn’t happen two years in a row. Despite that numbers of entrants bounced back to the level of a couple of years ago. Whilst Open section numbers rebounded the Restricted remained about the same. Larger numbers of G entrants, many first time in BERU, made up the numbers.. The prize draw seems to have stimulated a number of new entrants and the total entrants are back up to the levels of previous years. For the 75th event the travellers made DXpeditions to C5, ZL7, ZD7, ZF, J7, J8, VP9, 6Y and 9H. The Open section was won by Martin, ZF1UM, but the outstanding performance must surely be that of Peter, 9H3ET, who operated a Restricted station, field day style and turned in a fantastic score which would have gained him 2nd place in the Open section – beating most of the big guns in the process. The Team Contest attracted a lot more interest this year but the Team Caribbean/Atlantic just managed to hold off Team VK in the final reckoning. 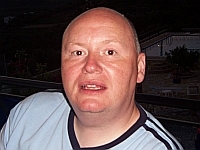 The prize draw for the SDR-IQ will be made by Martin Lynch at the RSGB Convention in October. 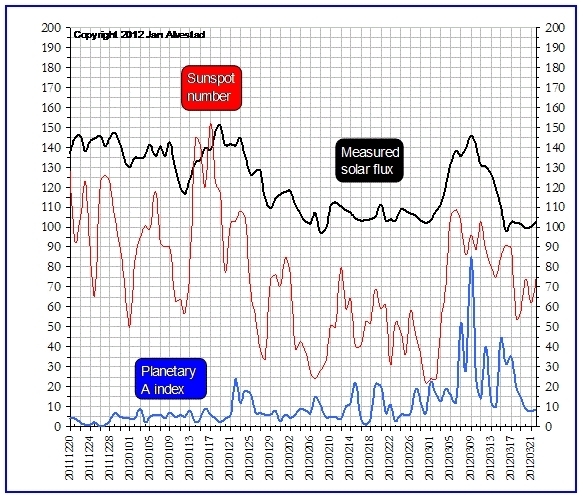 Solar info from Jan Alvestad. Martin, G4XUM, travelled to Cayman and operated as ZF1UM to take the Senior Rosebowl at the first attempt. 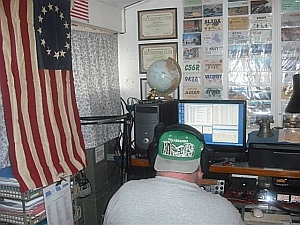 Martin used the club station of the Cayman Amateur Radio Club. 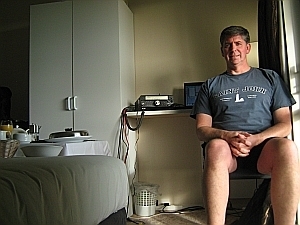 Martin amassed 1012 QSOs and crucially 261 bonuses. Martin commented, ‘First time in BERU for me and very pleased with the outcome – guess I’m hooked. Apart from a couple of hours solar blackout on Saturday everything went well. I had a few antenna issues which compromised me at times. Thanks to the Cayman Amateur Ra dio Society for letting me operate, and a big thanks to those who QSY’ed when asked. Last but not least thanks to Mike G7VJR for the loan of the solid state amp’. Second was John, VE3EJ, with 9350 from 894 QSOs and 244 bonuses. In third place was Nigel, ZD7XF, who managed a score of 9040 from 1104 QSOs but could only manage 176 bonuses. Nigel Operated for nearly the whole time (23 hours) with just two short 20 minute snoozes. Located at 15 deg south in the Atlantic St Helena is a bit far from the two main areas of activity (UK and VE) and particularly from western VE. 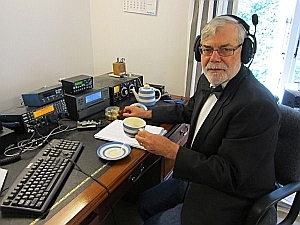 However the excellent north-south path into the UK enabled the QSO total on 10m to be over 350 QSOs. But down on 80m it was a struggle to be heard much of the time except for a fine opening to the UK at just before sunrise (0625z) on St Helena. Used horizontal wire dipoles on 10m, 20m and 80m and a quarterwave 40m vertical on both 40m and 15m. The greater rarity of ZD7 made it more difficult than usual (i.e from the Caribbean) to keep the non-BERU callers under control. Once again there were many UK sta tions worked who seem only to make an annual appearance on the bands during BERU. Working these stations is all part of the fun of BERU! 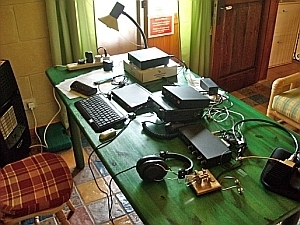 In 4th place was Dave, J88DR, with a score of 8700 from 852 QSOs Dave reports that they were very difficult conditions this year but a very well supported event despite the sun’s bad behavior Since his linear was wrecked by termites the station this year ran just 100 watts. Next highest UK station was Gavin, GM0GAV, with 7115 from 351. Closely followed by Don, G3BJ, with 7080 from 360 QSOs.who commented, ‘ A great contest again hampered a little by the A index ! Seemed good activity and all the usuals plus a bundle of travellers made it good fun. 10m surprisingly good and 80m disappointing with a combination of poor auroral path and QSB/QRN. The highest ZL station was ZL3IO in 29th place conditions being badly affected by the poor solar conditions. . The Restricted Section showed a small fall in numbers, but still remains popular. All of the top 5 places being taken by DX travellers, 9H3ET, 9H3C, C56XA, G3MXJ, J79SZ. 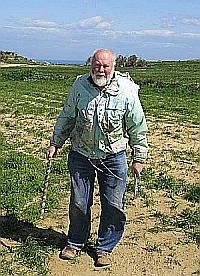 The leading station was Peter,, 9H3ET, who mounted a field day style operation from the north western tip of Gozo. 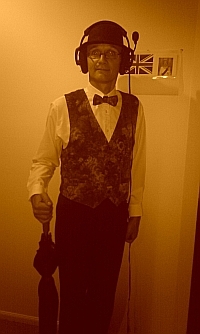 Peters score was truly outstanding, 9690 from 1070 QSOs and 217 bonuses to take the Junior Rosebowl! There was nothing junior about this performance being a record score for a Restricted station. Peter’s trip, made overland from the UK, was a triumph of logistics. Here he is after the event recovering the antennas from the muddy field. 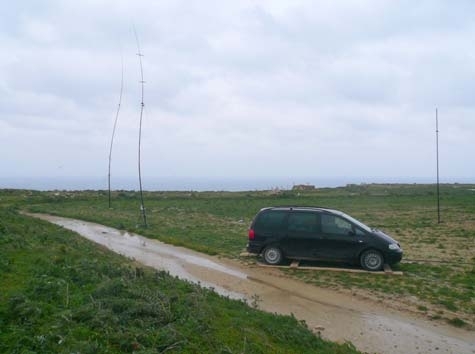 With 6275 from 723 QSOs and in second place was the other Gozo station, Peter, 9H3C, I used the fan dipole system I took to VP2V in 2011 and it worked VFB in spite of being erected entirely on the flat villa roof. Must get a K3 for next time as the IC706Mk2G can’t really cope with strong adjacent signals. The evening before the start of the contest saw 80mph winds and torrential rain some of which must have got into the balun as it was u/s when I setup five mins before the start. It took around 40 minutes to drop the antenna and change it for the spare. While I had a game plan I could not find enough multipliers to make my 733 Qs into a bigger one than I got with around 600s last year. Peter Hobbs 9H3ET was doing brilliantly from a /P location just 10 miles north of me in spite of being axle deep in mud having gale force winds with heavy rain that broke his 80m ground plane and he logged on paper throughout!! Where to next year? Malta had almost no sunshine this time and cold temps. And in 4 place, welcome back to Dennis, G3MXJ, who made his own trip back from France for the contest!. And in doing so takes the John Dunnington Trophy by being the highest placed UK station who has not won the trophy for the past 2 years. 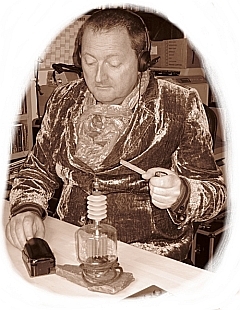 Dennis operated from the home of Maud Slater (XYL of G3FXB), to activate his old location once again, from which Al had entered virtually every year since the 1950’s. 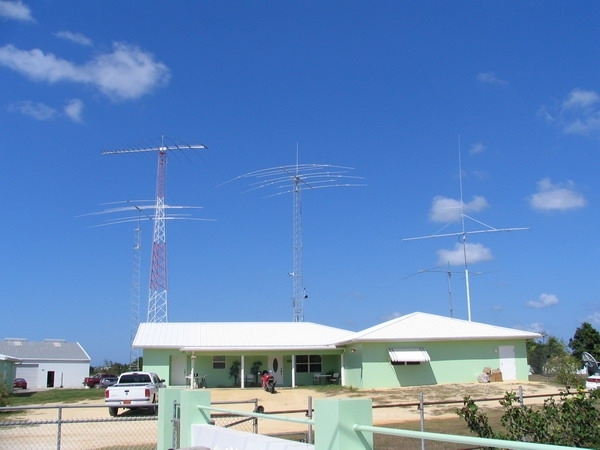 ZL1AMO As a memorial for a famous DXpeditioner and superb operator, NZART (with the family’s approval) authorised the use of ZL1AMO by the NZART HQ station during the Commonwealth contest. 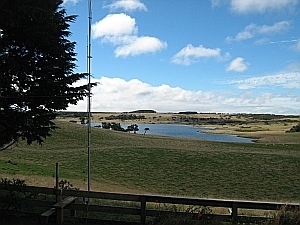 GB75CC, special call for the 75th BERU, was operated this year by Chris, GM3WOJ and Vic, G4BYG, (see left) from the GM2V contest station near Inverness,leads the 4 HQ Stations, GB75CC, ZL1AMO, VE7RAC, and VA3RAC which were active. Eighteen stations entered the Multi-operator section which was won by VO1HP (5715 from 695 QSOs). At the moment we dont have any trophies for this section but we would like to have one for next year.. The Ross Carey Rose Bowl goes to Ian, G3KZR, as the highest placed UK station who operated for 12 hours. Some 10 entrants travelled to Commonwealth countries specially for the contest or were on DXpeditions at the time. Dave said, ‘I was so excited to be able to activate Chatham Island for BERU but that excitement turned to frustration with the poor propagation. I had many long periods when I could hear no signals – a complete ionospheric blackout or periods when I could hear only one station who I had already worked. This was a hard year to go “restricted” from a very remote spot. Towards the end I felt very embarrassed by my poor QSO total. Perhaps I can console myself with the ZL7 record and be pleased that I have now visited this beautiful island. The Henga Lodge is very ham-friendly. And read all about Dave’s trip here. The certificate for the leading QRP entrant goes to Dave, G3YMC. The Commonwealth Medal is awarded to Lee, VE7CC. Lee first appears in the BERU top ten placings in 1975 and then went on the achieve his first win of 7 in 1976. He last won in 1988 and has been a consistent entrant since. So thanks to you Lee for the 37 plus years of entries and all the bonuses. Team Contest This year team sizes were reduced to 5 and multiple teams from call areas were encouraged. This seems to have been well received and provided an extra incentive to enter. Team Australia very nearly knocked the Team Caribbean/Atlantic off their perch at the top. 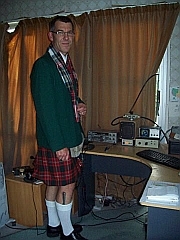 And not to be outdone, Gary, ZL2IFB sent in this one ……must have been a very strong solar storm in ZL! 9M6XRO Condx fair despite a lot of “space weather” around. 10m was open from time to time. Thanks again to the organisers 73 to all from Borneo and of course HAPPY 75th! G0ORH Managed to get a team up together and had lots of fun though the back shift was not so good what noise! But still managed 16 5 bander slots 6 4 bander slots. Some ops would not qsy but thankfully the majority did….Phew. 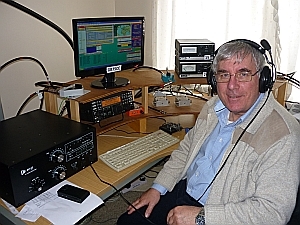 Gary zl2ifb sent me a recording of my 20m lp cw tone which is on his web site. Its quite interesting how strange propagation changes sounds!! I must try a travelling g trip……But where! Great show organisers and the team m0dho g0opb g3xtt g3vpw. We entered we adapted we persevered and we enjoyed! 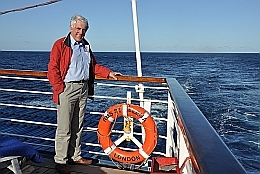 Ken g0orh capt – team thames valley. G0VDZ This has to have been the greatest disaster since the Titanic. G3TQZ This IS my first entry in BERU and my first contest entry for over 40 years. VE1AL I really dislike the categories in BERU. VE1ZJ Great contest. Good participation.Other years 12 or 13 countries worked. This year 25 worked. VE5ZX The propagation gods struck VE5-land with a mighty force again. While our neighbors in eastern Canada were giving out serial numbers in the hundreds we only in the tens. VE5-land is next year contesting country. ZL2BR The solar flare certainly spoiled the party in a big way, with polar and near-polar propagation paths being severely affected. This resulted in my lowest score and qso totals since 1987. eg only 34 VE contacts, in 2010 I had 91, etc etc Half (flattened-world) diameter distance signals, that is up to say 9,000km from ZL such as VK,9M and 9V were excellent, all other signals were weak or got lost in transit. Our VK friends across the Tasman (Sea) certainly had a bigger bite of the Beru cake this year than us ZLs. Is is VK and ZL, or VK or ZL? I suspect many UK and other Eu stations, group VK and ZL together as a single dx target area, which incorrect. A Great Circle map centered on UK, shows short path bearings thus: VK6 – 90 degrees VK3 – 75 degrees Southern tip of NZ South Island – 60 degrees Central NZ North Island – 10 degrees 75 per cent of the NZ population live in the North Island and this includes at least two of the ZL3s and one ZL4 who were active in the CC this year. So next year, UK stations with directional antennas should, please beam South or North to work the majority of ZL’s and beam West or East to work the majority of VK’s! Adjudication Almost all the logs received were submitted via the Robot this year. There were a few minor problems with formatting and interpretation of the Robot’s responses, but nothing insurmountable. Logs submitted on paper were still in double figures. Hand-written logs are always welcome but should be submitted as a sequential list of QSOs … the ‘separate log for each band’ format went out years ago. The usual penalties were applied for carelessness in copying callsigns (there were a few real howlers), reports or serial numbers. As well as sloppy sending by hand, mis-use of logging software, including some of the most popular programs, can also lead to serial numbers not being correctly logged at the transmitting end. This is not easy to detect at the adjudication stage, but a number of cases were established beyond doubt and were suitably penalised. In a number of other cases, the sending station was strongly suspected to be in error but it could not be proved – on these occasions neither station was penalised. A small number of stations submitting single-operator entries were found to been actively using the cluster while making contest QSOs – almost all were re-classified in the multi-op/assisted category. The rules for 2013 will be changed to exclude any involvement with the cluster for single-operator stations. Comments and/or queries about the adjudication may be addressed to commonwealth.contest@rsgbcc.org or to secretary@rsgbcc.org .